Blade Show 2017 is right around the corner, and this year, we couldn’t be more excited–not just because we’ve been looking forward to good southern BBQ for months–but because it’s going to be our biggest show to date! 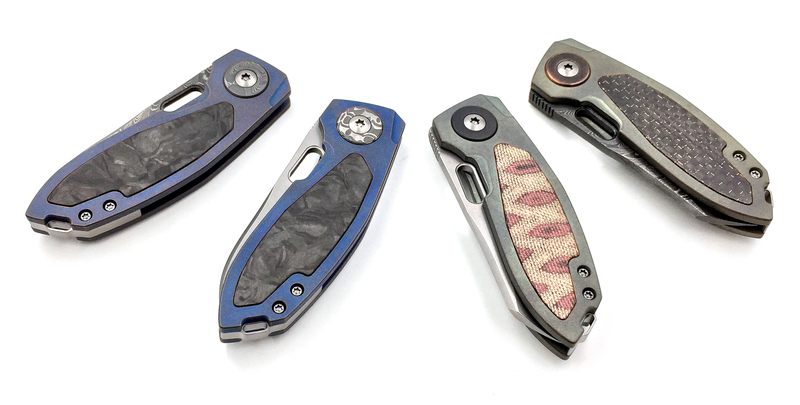 Luc has been pulling out all the stops, and we have a couple images of finished knives to share with you. You can also keep up with our progress on Facebook and Instagram and check out the show schedule below. We’re at booth #635 this year–can’t wait to see you there! Note: First come, first served Cypop table sales are ONE per show per customer. This is to help give more people a better chance. In other words, if you line up and buy one from us on Friday morning, please don’t queue on Saturday morning. Thanks in advance! Kwaiken Classics, Peregrines, Kihons, Hucks, Cypops, SlingPops, and other goods will be sold first come, first served. The first 5 people in the VIP / Early Bird line wearing a Burnley Knives shirt (we’ll come find you before the doors open) will be guaranteed the opportunity to purchase a Cypop. Burnley Beep Beep lottery tickets available starting at 2:00 PM. Lottery sign-up runs until 4:00 PM. Tickets are limited and will be given out on a first come, first served basis. All names will be drawn by 5:30 PM. Luc has donated an inlaid M69 and a Liner Lock Kwaiken to AKTI’s live auction. If you’re looking to buy a custom piece (and hang out with Luc and some other top makers), this is a really great opportunity away from the madness of the show floor! Plus, 100% of proceeds from the live auction will go to AKTI to help fund their legislative and education efforts. AKTI does a lot for our industry, and the support is greatly appreciated. Check out the knives here. Tickets are on sale now ($50), and your entry to the event includes light hor d’oeuvres and a drink ticket. Burnley Beep Beep lottery tickets available starting at 11:00 AM. Lottery sign-up runs until 1:00 PM. Tickets are limited and will be given out on a first come, first served basis. All names will be drawn by 2:00 PM. Bidding closes at 3:00 PM (EST). The 5 minute rule applies. Those not attending are welcomed to send bids in via email or our new online form. Details for both will be posted on our website and sent out in a newsletter. We’re trying something a little different this year’s club lottery. Show up and bring your member badge (Burnley issue or USN issue). We’ll run our lottery, and do our annual group photo afterward! Come by the booth to say “Hi”! We’ll actually have time to talk! !